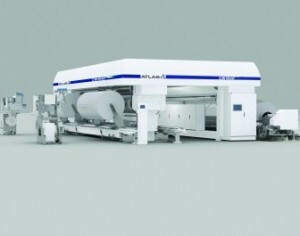 Atlas Converting Equipment Ltd. revealed an order from Daelim Industrial Co Ltd of South Korea for a new 8.7m wide Atlas CW1040 Series primary slitter rewinder. The slitter will be installed in conjunction with a new BOPP film line at Daelim Industrial’s facility in Jeonju. According to the US-based Atlas, the new BOPP film is due to commence during the first quarter of 2013 with an estimated annual production capacity of approximately 38,000 tons. The new CW1040 Series technology platform is a new generation of more compact film slitting solutions in web widths from 2.5-10.4m (98-410″) and is said to deliver higher efficiency, increased productivity and reliability, higher quality rewind reels, reduced noise levels and more effective, operator-friendly control systems. Daelim Industrial was one of the first manufacturers to invest in this new technology platform when they confirmed the order in October last year. This latest slitter rewinder technology features wireless rewind arm positioning, automatic knife positioning, direct drive web path rollers and running speeds of up to 1,500m/min (4,920 ft/min) with more precise web tension control, says Atlas. Electrical cabinets are now fully integrated in to the machines to reduce the space required for installation with “under floor” service trenches also no longer required for the primary slitter rewinders. In addition, Atlas announced that it has appointed Coras do Brasil, locating in São Paulo, as the new agent in Brazil. The agreement covers sales of new slitter rewinders, upgrades and retrofits to existing installed machinery, spare parts and customer support in the country.